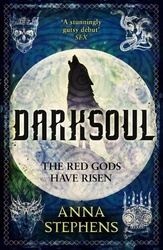 Evil gods walk the land as armies prepare for war in this thrilling grimdark sequel to the epic fantasy debut Godblind. The Wolves lie dead beside Rilpor’s soldiers, slaughtered at the hands of the Mireces and their fanatical army. The veil that once kept the Red Gods at bay has been left in tatters as the Dark Lady’s plans for the world come to fruition. All that stands between the Mireces army and complete control of the Kingdom of Rilpor are the walls of its capital, Rilporin, and those besieged inside. But hope might yet bloom in the most unlikeliest of places: in the heart of a former slave, in the mind of a soldier with the eyes of a fox, and in the hands of a general who is destined to be king.